SILVER SPRING, Md. --- A Pathfinder honor about the dangers of rock and roll was launched today. 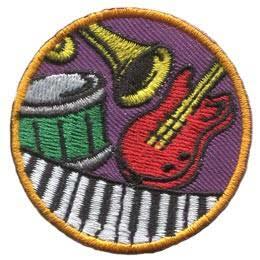 Would-be patch recipients will have to flawlessly recite 28 reasons why a drum set should never be seen in an Adventist church. Additionally, Pathfinders wishing to add the Rock and Roll badge to their sashes will have to explain why recorded drum tracks accompanying Sabbath special music performances are OK despite the ban on visible drum sets. Pathfinders will be required to memorize the entire history of shady attempts at subliminal messaging through popular music. In addition, they will be treated to recordings of scary rocker songs from the 80's played backward. Now we finally know why John McCain was so befuddled as to call me “President Comey.” It’s not a lack of sleep as he claimed, nor is it age-onset dementia. It is his habit of listening to backwards-masking rock tunes! Those will confuse anyone–even President Ben Carson! Real COOOOOOL! This will go with my Rock honor, my Rock Climbing Honor, my Rocket Honor, my Tennis Racket Honor, my Rocky Horror Show Honor, my Sticky Wicket Honor, my Tiddley Winks Honor and so many more I lost count. Who is going to teach this Honor at the next Camporee? Try to get Little Richard, the Take Six, what about Amy Grant? Black Sabbath? I want to sign up today. Count me in. I am working on 50’s Rock & Roll Honor with Bill Halley & the Comets and my friend, Fats Domino. WOOOOOOOOOOOOOOOOO!! Great idea for an honor but let’s reverse the requirements outlined above. We need Adventist drummers, guitar players, bass players, keys players and singers to replicate the music of today and to write and perform original works of music in the church using these instruments.